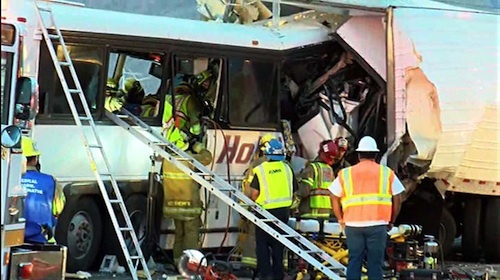 Yet another fatal highway rear-ending incident has occurred and this time it was a tour bus crashing into the rear of a semi-truck that was slowed in a traffic back-up on the 10 Freeway Mojave Desert stretch in California. 13 people died and 31 were injured as a result of the crash. The tragic accident occurred at around 5:17 am Sunday morning on the 10 Freeway just north of Palm Springs, CA. A charter tour bus operated by a company called USA Holiday, that provides inexpensive night-trips from Los Angeles to various casinos sprinkled throughout the Mojave Desert, was making its way back to Los Angeles from the Red Earth Casino, located on the western edge of the Salton Sea in Thermal, California. The bus was moving at a highway speed with 44 people on board, when it came upon backed up traffic in an area where a Southern California Edison crew was doing maintenance on electric wires along the freeway. California Highway Patrol officers had been on the scene to slow and stop traffic as the crew completed their work and according to CHP Sgt. Daniel Hesser, the traffic had just started to move again before the collision occurred. The traffic was still moving much lower than typical freeway cruising speeds when the bus came along and crashed into the back of a semi-truck at the end of the line. “The impact just, you know, hit me from behind and I just blacked out for a minute and when I gained my consciousness, I undid my seatbelt and looked around. Thought I got ran over by something. That’s when I got out of my truck,” said the truck driver who was hit by the bus. In fact despite his wounds, the driver’s thoughts immediately went to the potential victims in the vehicle that hit him and he began helping to pull passengers out of the bus before crews arrived on the scene. “You got to think about others. I’m going to be alright. I want to get them safe. I don’t know if the bus is going to blow up,” he explained. Fortunately the bus never did blow-up, but the force of the impact was strong enough to completely crumple the first third of the passenger cabin into the rear of the truck's trailer. "The front six rows, where 12 people had been sitting, were squashed together. Everyone, dead and alive, was covered with blood,” said bus passenger, Miguel Martinez. The bus driver and 12 passengers were killed and 31 passengers suffered injuries ranging from critical to moderate. Authorities with the National Transportation Safety Board arrived in Southern California early on Monday to investigate the crash. With the investigation still in its early stages and with the bus driver deceased, it's hard to determine exactly why the tragedy had to happen at all. 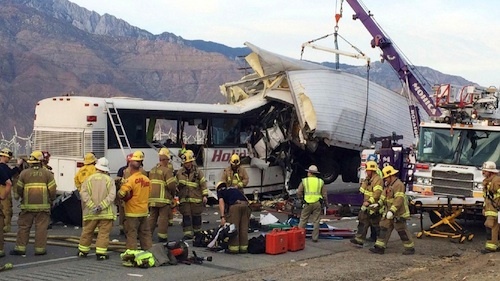 It is among the deadliest recent crashes to occur in California, with the next being the April 2014 incident involving a Fed-ex truck slamming into a school bus and killing 10 people. Hate to be bearer of bad news, but commercial coaches are ALWAYS driving aggressively, and flying. AND most all police officers just ignore their actions. Government talks safety but when it comes to the most precious cargo, people, most often turn a blind eye. Not to overlook the tragedy of the wreck, but the Ca. State investigators said yesterday that they believe worn tires (they were below legal tread depth) may have been a contributing factor. WHAT!!! He drove into stopped traffic, rear ended a stopped (5mph) truck at high speed-no skid marks. And they think it might be worn tires! Idiots might as well claim global warming caused it. It will be blamed on the truck driver for not running his four way flashers at the end of the line. It is illegal to run 4-ways in lane of travel in California, btw. I think that would be irresponsible on the part of the law, your telling me if there is a crash up in front of you and you have to break a little hard with turning your fourway lights on too notify the driver behind you to slow down that you would get a ticket. Them buses drive way to fast especially with passenger's on board. Never see them get pulled over like we do. My heart goes out to the families of all involved, and to the injured. Seen it on the news the bus was 13 ft. In the trailer . That's an impact no doubt !!! Ban all high capacity vehicles so can stop all this killings of innocent people!!! Hush Herald I'm picking and choosing what I want just like the liberals do so I can see how it feels!! Michael you are the weakest link....SMH,LMAO!! Cliff your a baggage handler so go back and pack bags. HAHAHAAAA,is that the best you got PUGSLEY!!! And I suppose you will spend the rest of your life volunteering to carry each and every person to the places they would like to go?! Get rid of split speeds in these states! That's the same results "speed limiters" will have. Go sit in the corner. That was the most stupidest comment I have heard all year and that says a lot. I'm sure they will find a way to pin the blame on the truck driver. If I was a betting man I would bet that the bus driver was a foreign national. I heard that the bus had just left a casino. Yummy legs mmmm I love!!! Cliff I like the way you think! !